The first stage doesn't have loop, it begins with an accords that doesn't repeat in any other moment of the song, so is not possible to force any loop. Señor Ventura MSU1 PCMs allow you to loop back to a specified Sample point. 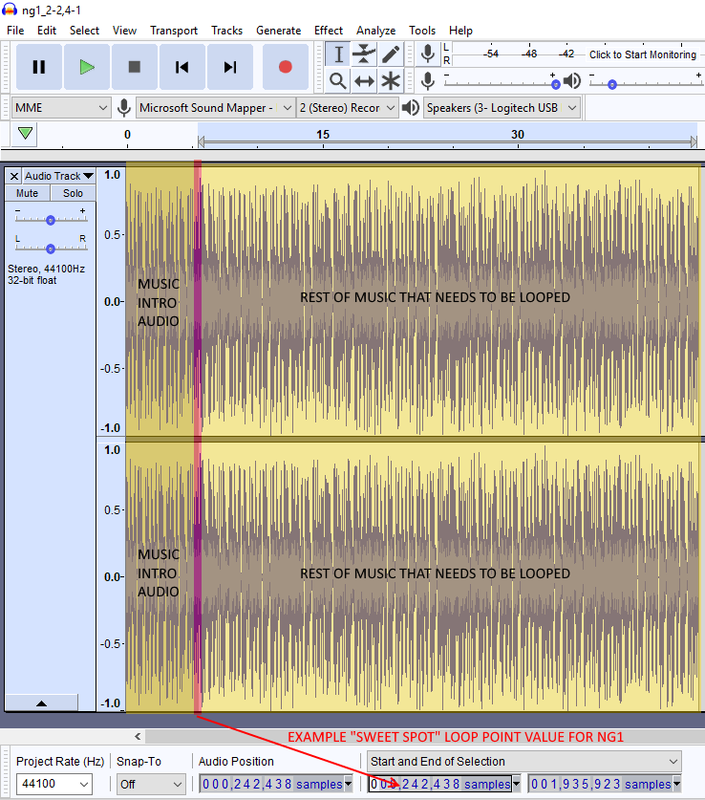 You can use a freeware app called Audacity to find the loop “sweet spot”. With this value you can use another tool to hard code the value into the PCM. Qwerty has a guide on how to use this tool as well. I would help you further but I’m not at home at the moment. pepillopev wrote: Señor Ventura MSU1 PCMs allow you to loop back to a specified Sample point. You can use a freeware app called Audacity to find the loop “sweet spot”. With this value you can use another tool to hard code the value into the PCM. Qwerty has a guide on how to use this tool as well. I would help you further but I’m not at home at the moment. That is a better solution, and it will let shorten the songs considerably. Ok, i have to finish a couple of things here, and i will put myself to read how to do this. Since a time i wanted to learn, so, is not a bad moment. Audacity mutes my headphones and i hear nothing... i have to put it directly in the control pod of my logitech z5500, but it lags a little and i don't receive the sound inmediately when i starts something after pausing/stopping, so i'm dead right now when i need to localize the exact point to identify the points to loop the track. @Señor Ventura In the toolbar you will need to select your output audio device. By default it goes to the original connected audio device (normally not headphones). You will need to select your headset to pipe the audio to them. 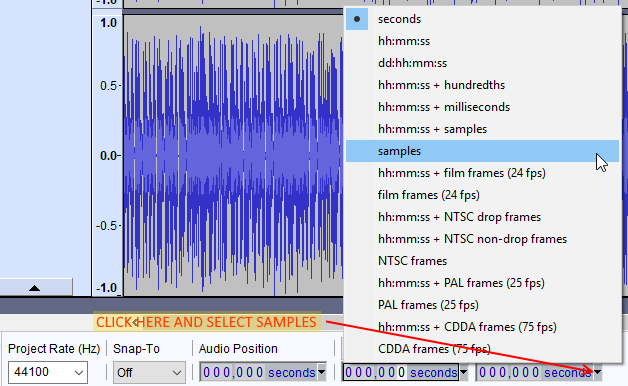 @Señor Ventura Here is a quick rundown for using Sample Audio position mode in Audacity. #3 Use wav2msu.exe** via command line to write loop value into PCM. Afterwards, your WAV file will be converted into a PCM file with the loop value hard coded into it. Now you can use foobar with Qwerty's plugin to listen if it loops seamlessly or Goldwave (if this is your preferred app to use). This is just a crude way of doing this. It can be made more automated using Qwerty's msupcm++ with JSON files. I suggest getting a hang of this first before moving to JSON method. You can also use Audacity to listen to your WAV to find that "perfect" loop point too. You can get foobar with Qwerty's msu plugin already included via this LINK. Just decompress it with 7zip or WinRAR and assign the msu PCMs to this app (similar to what you did with Goldwave). Foobar2000 will automatically start playing the MSU1 PCM the moment you open them. You can also drag and drop more PCM files into foobar to play them. @pepillopev I did found the problem already... some software, like magic samplitude, mutes all from any program except its own itself, and after that all were conflicts with the sound until i restarted the pc. P.D: In emulators the music sounds louder than the sound effects, but with the sd2snes it sounds more or less aceptable. The problem is that if i correct a volume set for one, it messes up the other, and vice versa. @Señor Ventura Yeah, unfortunately, this will always be an issue for RevF and below Sd2snes boards vs emulator audio. This is not an issue with RevH sd2snes boards (to my understanding). I’m waiting for my Borti revF to revH mod board for this reason. Hopefully with this upgrade I can better balance the audio in emulators and actual hardware. In essence, the same audio balance will fit both platforms. I am not really a fan of the software audio boost feature built into the current 1.8.0 release on my revF. pepillopev wrote: @Señor Ventura Yeah, unfortunately, this will always be an issue for RevF and below Sd2snes boards vs emulator audio. This is not an issue with RevH sd2snes boards (to my understanding). I’m waiting for my Borti revF to revH mod board for this reason. Hopefully with this upgrade I can better balance the audio in emulators and actual hardware. In essence, the same audio balance will fit both platforms. So, the correct volume is the marked by the emulator, and the emulator volume level matches with the later versions of the sd2snes, but not with the first pcb's, is that correct?. So i have to readjust the volume level of the pack... well, it can be ready tomorrow. edit: My sd2snes is one of these older pcb's, How can i do to upgrade it?. @Señor Ventura That is really up to you. There is really no right answer for this scenario. I normally stick between 20-26dB range (depending on how loud the FX is in games). Ask other PCM artists how they make a decision regarding this. Maybe Relikk might have some advice. The Revision H sd2snes is suppose to be the perfect version from what I read. The volume set for emulators should match with this sd2snes. Once I update mine, I’ll see for myself if this is true. Or someone else with a RevH can answer this. Finally i corrected the volume level of all the tracks with the correct values. Now it works as it should. I have reduced the file size now to 112 MB, wich is an improvement in terms of efficiency. The rest is well known... looped, post-processed, and all that stuff... i think it sounds good, and finally i can continue with the ninja gaiden 2 OST. @Señor Ventura Is this set a replacement for your first NG1 set? Just asking in order to make sure duplicate sets are not posted. pepillopev wrote: @Señor Ventura Is this set a replacement for your first NG1 set? Just asking in order to make sure duplicate sets are not posted. Yes, this new pack replaces the previous one, cause the other pack had a bad volume level for emulators and the new standard of sd2snes. Now i'm doing the ninja gaiden 2 tracks, and later i will don't know what to do with the ninja gaiden 3, cause it has an very flat OST (musically speaking). @Señor Ventura Ok, that is what I figured. I replaced your previous link with the new one and made the appropriate annotations. Good job. I have 3 tracks of the NG2 ost without assign. And there are in the msu1 pack three tracks named ngt-msu1-61, ngt-msu1-62, and ngt-msu1-63 with different songs, and i don't know if the three youtube tracks should be in any of these "ngt-msu1-6x", or there are three more. I don't know if these are an (very) free version of the songs, or really i missed some tracks. Señor Ventura Below is the text file that has all the msu values and brief descriptions for all three Ninja Gaiden names. Hope this helps you out. In the example above (taken from text file), you will only care about the third column (this would be your ngt-msu1-61, ngt-msu1-62, etc). pepillopev wrote: Señor Ventura Below is the text file that has all the msu values and brief descriptions for all three Ninja Gaiden names. Hope this helps you out. I was afraid of this... i have three tracks out of the list, i mean, i have three songs more than the listed. Anyway, i will take a look again tomorrow. @Señor Ventura If my memory is correct when making this patch, each Ninja Gaiden game in this Trilogy pack has its own track for Act Introduction and Ryu Died. pepillopev wrote: @Señor Ventura If my memory is correct when making this patch, each Ninja Gaiden game in this Trilogy pack has its own track for Act Introduction and Ryu Died. Yes, the thing is that the OST of youtube shows an game over theme cause in the nes version there is an game over theme, but in the NG trilogy of snes the game pass directly to the password screen. So, there is no problem with that finally. Boss Battle 03 I do not recall ever hearing it during my play testing. I watched a long play video to compare my play through to confirm this. Below is a youtube video link for NG2 Boss Rush and their respective music. As for Game Over, I never got a track trigger for this in the SNES version, from what I remember. That's right, you have got the reason... is just that cut scene 14 and 49.pcm doesn't begins identical, and lasts a while to reach the part in what these sound the same. Ok, i see, so it is no necessary too (just like the "game over" screen case), and all is correct with my pcm pack. pepillopev wrote: As for Game Over, I never got a track trigger for this in the SNES version, from what I remember. Ninja Gaiden 2 remasterd OST from NES. The file occupies 99MB, has all the filters, wide stereo, looped, and sounds really good with headphones. I don't know what to do with the ninja gaiden 3 ost, cause it is really bad, and don't worth the effort to remaster it... maybe i could do something new with it. @Señor Ventura Cool, linked to the top. Thanks again.